Sophomore outfielder Matt Rudick crosses home plate in the eighth inning of the Aztecs' 6-4 victory over Arizona on March 25 at Tony Gwynn Stadium. 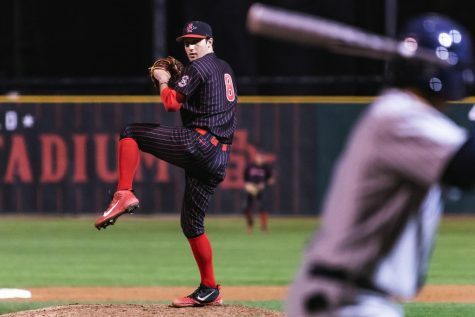 San Diego State baseball extended its win streak to three games, defeating Loyola Marymount by a final score of 4-2 on April 9 at Tony Gwynn Stadium. 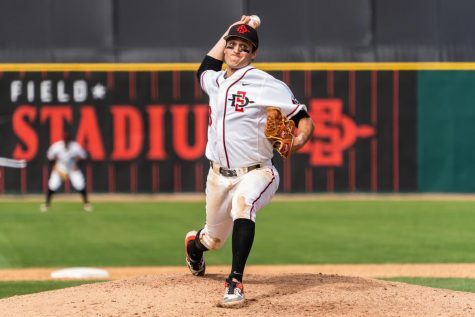 Freshman pitcher Aaron Eden led the Aztecs (19-14, 7-6), pitching six innings and allowing five hits and a walk while throwing two strikeouts. Eden held the Lions (20-12, 9-3) to just two runs (one unearned) in his second win of the season. Eden said unity has been a key factor in winning recent ball games. Sophomore Casey Schmitt started the game at third base but replaced Eden in the top of the seventh, tossing three shutout innings with three strikeouts to earn the save. Schmitt said he had a simple approach on the mound. 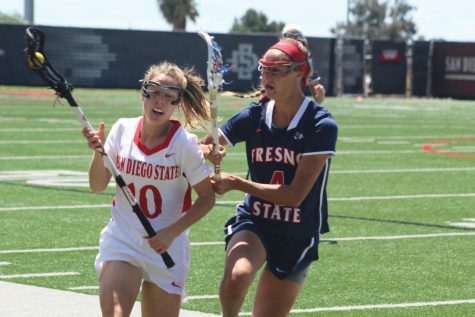 Offensively, the Aztecs were hot from the start, scoring three runs in the first inning. Sophomore left fielder Matt Rudick kick-started the offense with a double and scored via a single by senior shortstop Angelo Armenta. Freshman first baseman Brian Leonhardt drove in Schmitt with a double, and junior right fielder Matt Jarvis’ groundout scored Armenta to put the Aztecs up 3-0. 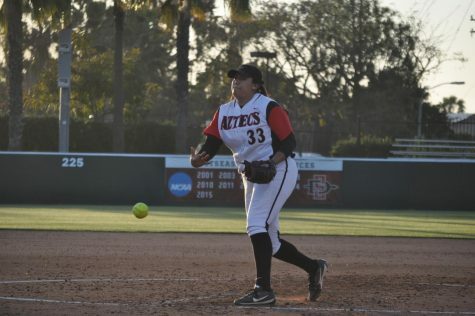 Head coach Mark Martinez said the Aztecs had success at the plate during two-out rallies throughout the game. The Aztecs were unable to score any runs after the first inning until the eighth. 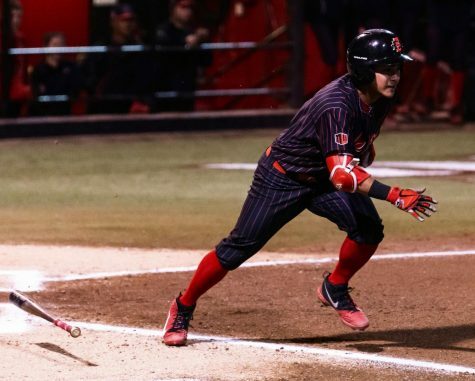 SDSU left two runners stranded in both the third and fourth innings and left the bases loaded in the fifth. 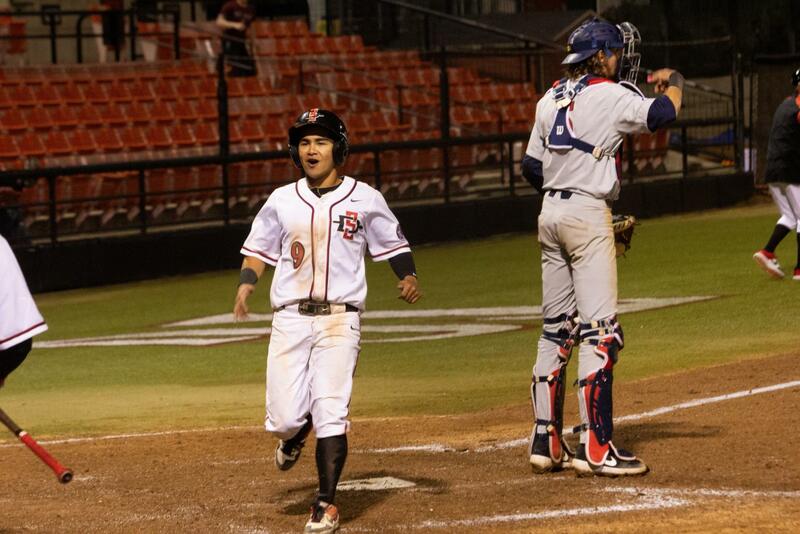 The Aztecs had another prime scoring opportunity in the eighth inning with the bases loaded. 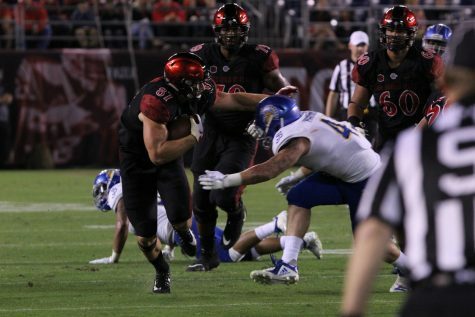 Junior outfielder Julian Escobedo was walked to bring in SDSU’s fourth run of the game, but the Aztecs were held scoreless from then on. At the end of the game, 11 SDSU baserunners were left on base. Despite the amount of runners left stranded, Martinez said the Aztecs still delivered when the bell was rung. Junior shortstop Nick Sogard and junior right fielder Trevin Esquerra led Loyola Marymount with two hits and a run batted in each. Esquerra hit the game’s only home run to deep right field in the top of the sixth. 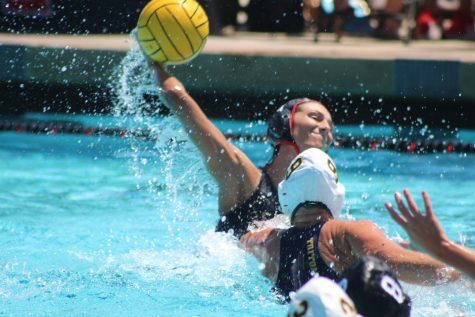 The Scarlet and Black are set to play its next four games in Orange County, facing Cal State Fullerton in a three-game set from April 12 to 14 and UC Irvine on April 16.